Here is our assessment of the Dec. 3-4 storm along with a few thoughts. We think if most forecasters are honest with themselves, they’d say that this storm slightly exceeded predictions and had more energy in the second half of the storm than many expected. Although our perspective is intensely Twin Cities-focused, the storm was generally well predicted from an overall regional perspective with regard to storm timing and general trends. As of Friday evening, approximately 24 hours before storm onset, the vast majority of forecasters predicted 1-3 inches. The only exceptions were the national forecasters, who predicted less. For our assessment purposes, we base the majority of our grading on forecasts made 24 hours before a storm. Once the storm is underway, it becomes more an exercise in nowcasting, which is an art in and of itself. Snowfall at the Minneapolis/St. Paul airport was 4.4 inches and from a graphic provided by the National Weather Service, the best assessment would be to call this a 2-5 or 3-5 inch storm, depending on how wide you want you want to define the metro area. On the whole, we’d tend to give most forecasters a B with perhaps an A-/B+ to the National Weather Service who noted the possibility of 3-5 inches on Saturday morning, when all other forecasting outlets remained at 1-3 inches. Accuweather would rate a D for predicting .8 inches of snow. Nobody can fault forecasters for making mistakes. They’re human and meteorology is an inexact science. While we try to provide a record of their predictions (against actual results), we also emphasize the communication aspect of weather forecasting and how forecast presentations fall on the eyes and ears of the average viewer drawing “reasonable man” conclusions to what they’ve heard. While it doesn’t thrill us to watch a forecast where the met manages to avoid saying something that shows a connection to the viewer such as “if you watched us earlier, you know that we thought there’d only be one more inch to fall… but obviously, we ended up receiving more than that,” we can live with that. But what we find credibility-damaging is when the met falls over himself (or herself, should that be the case) patting himself on the back when in reality he missed the forecast! On Saturday night, Fox9’s Steve Frazier commented over and over how the storm played out exactly as he’d expected (he even excused himself for patting himself on the back numerous times on the forecast). His presentation included snowfall amounts that he admitted were gathered when snow was still falling steadily and were likely to go higher. He noted that a measurement at the Fox 9 studio in Eden Prairie (where one would expect totals to be lower than in places like the airport, St. Paul and points east) revealed that about three inches of snow had fallen. The amounts he displayed reflected a 1-3 range of snow across the metro area. Blithely ignoring his comment that the totals were likely to go higher, he went on to use the incomplete estimates to make his case that he nailed his 1-3 inch forecast. Minutes after his presentation, an official measurement from the airport came in at 4.2 inches, providing indisputable proof that Frazier’s 1-3 inch conclusion was off. Ensuing snowfall reports suggested that a truer metro-wide forecast would have been something like 2-4 or 2-5 inches. We find his presentation – sloppy at best and disingenuous at worst – the kind of thing that doesn’t sit well with viewers who watch faithfully. Follow The Minnesota Forecaster on us on Twitter and Facebook for updates. From what I understand, Steve Frazier is a freelancer who is not under an exclusive contract with any station. That's why you'll see him from time to time on the #5 and #9.
they picked up Frazier when Monica J had her baby. When she returns I bet Frazier disappears. Bill I think the NWS deserves a full A. They were the only ones to point out that there was a high probability that the deformation zone would set up right overthe metro, which is whatbasically happened. And this is the second snow event in a row where the NAM was consistently printing out over 4" inches, much more than any other model, all local mets dismissed it, and it actually turned out to be the most accurate. I think Bill is being generous with (in)accuweather. I think you both (Anonymous on the NWS A and CWY2190 on Inaccuweather) make good points. I'm not even sure I should continue tracking Inaccuweather... then again they're good for comic relief. I like Novak a lot, but he is really bragging about himself on his twitter account. Novak even has to admit that he was "off" when looking at the strength in the SE metro. And it didn't "perform beautifully" for weather forecasters as he stated, in my opinion. Trying not to be critical but this smugness isn't much different than Steve Frazier in this case. I agree that the NWS did the best job..The AFD written by forecaster JLT issued at 223 Sat. morning was the first alert, nice job!! I saw Frazier last night, pitiful. This was a very hard storm to predict as described by Pat Hammer in his forecast early Friday morning, and I paraphrase here.....this is a hard one to forecast, some storm's present themselves to us and there it is, this is not one of those, there are way to many players on the map so here is what it looks like now....Hammer put just enough doubt in the viewers minds that his confidence was below average. That was one honest forecaster anyone see any others??? Jerrid Sebesta acknowledged on-air tonight that there was more snow than anticipated. Patrick Hammer also said the same in a tweet. Bill - well written. No one is expecting a forecast to be 100% accurate - but a lot is to be said for an on-air met to give an explanation - both before and after a storm. I think the public can handle that and move on. 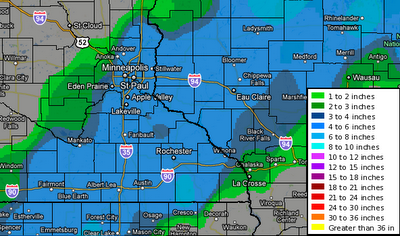 I would also expect a little more from the NWS-MSP in terms of a post-storm wrap up. Granted for the last storm, we aren't talking about a 12" snowstorm, but I'd like to see a little more than just the snow totals (and maybe a brief wrap-up is still being put together for this storm). Just feels like one is deserved based on following a storm for 3-4 days, although I guess that is why I come to this site. I'm guessing the NWS-MSP has their own internal ranking of storm results - such as counties that were issued advisories/warnings vs. what average amount of snow fell in each county. It would be nice to see if this info could be gathered from someone in our group and if the NWS would be willing to share that info. In some cases calling for 1-3" of snow for an area and the actual total ends up being 4.5", we are probably only talking about "missing the forcast" by about 0.05 to 0.08" of liquid equivalent (depending on the snow/water ratio). You really do have to have thick skin in the forecasting business. I'm glad I can appreicate the weather pretty much from the observer side. Dave Dahl doing 4:30am weather on KSTP!! WTH? Was he demoted? Hey all, I certainly wasn't intending to "brag about myself", but was attempting to state an opinion from a weather forecaster's perspective. When you look at weather models over and over and OVER again, you start to understand and appreciate when these models actually perform well. As stated, they hit this storm almost right on the nose (even 48 hours in advance! ), and this provided a forecaster the opportunity to accurately warn the public well in advance. Of course, "accuracy" is in the eye of the beholder, but I truly appreciate how these models performed, especially when considering some of the busts we've had over the years. Remember, the consensus was that a 4"-9" snow would fall over the southeast 1/3 of MN with the Twin Cities & LaCrosse being the locations of a sharp nw/se gradient. That is exactly what happened! Now, portions of the central MSP metro, including MSP International, received a couple more inches than expected, but that was more of an exception than the rule. The heavier snow axis moved about 20 to 30 miles further northwest than anticipated. We all knew that the metro was going to be a problem do to the sharp gradient, and this was beaten to death for days before the storm's arrival. Also, the higher end totals 7"-9" never really materialized, but reports of 5"-6" were common. All in all, I thought most forecasters & models performed exceptionally well when considering how difficult it is to predict the weather. I hope you feel the same too. I agree about the models. The NAM (using Cobb method) was printing 4.4 inches for MSP on Friday!!!!! Personally I'd like forecasters to be a bit bolder and narrow down those ranges a bit. And then take responsibility if they got it wrong. Predicting 1-3" or 2-4" is too easy. That is more than a 200% variation. If I were to tell my clients that based on my models their market shares could be 20% to 40% they would laugh at me. Last year, when the big storm hit, Dave Dahl had a chart predicting specific amounts for each area. And he nailed the MSP 17 inches. That is how it should be... people would appreciate you trying to be more specific and would not blame you as much if you missed it. Otherwise we can predict 1-10 inches for every storm as Paul DOuglas says he should do sometimes, and you are almost always guaranteed to be right. You can't get rid of ranges. You can say the Twin Cities will get 4 to 7. Someone will get 4. Someone will get 7. You can't narrow it down to neighborhood. @Novak I, for one, certainly don't take your assessment as bragging. I think you speak from the perspective of a regional meteorologist, and I don't think there's any doubt that from a regional perspective, the storm was generally well behaved. But, as we all know, weather can be highly local, and it just happened that much of the MSP metro population center was under the band that gave more than expected. @CWY2190 I don't see why forecasters can't make predictions for certain locations -- i.e, the airport, Burnsville, Maple Grove, etc. Actually, it seems they do that ... it's just that in the course of things -- because we all do live in various parts of the area -- the discussion quickly moves to a "range" discussion. @Bill and CWY2190. The metro could certainly be broken down into 4 quadrants using 35W and I394/94. That would give you a NW,NE,SE and SW quadrants. To properly do that you would have to choose a model that you think will verify and than look at how much QPF vs Temp profiles to manually calculate the snowfall. That info is generally available for MSP and the regional airports. For instance I use MSP, Blaine, Crystal,Flying Cloud,Lakeview,South ST Paul and Hollman Field. For some reason the NE metro doesn't have a airport in the system, so that's more of a guess. @Novak...I went back and looked at your forecast, generally speaking it worked out very well, nice job! Here is another snowfall total map, similar to the one that Bill posted above. This is from the NWS in LaCrosse and contains more detail to the snow amounts across the area. Enjoy! I have no idea how in the world this map was created and/or how accurate it is. There is no way humanly possible to get so detailed with snowfall totals. You have to take surface snow total observations with a grain of salt since 5" to one person could be 3.5" to another. Hell, my neighbor measured 4" outside of his house by Sunday AM while I measured 5.5". Because of this conundrum, I believe it is best to broad brush the totals so that they make a bit more sense. I'm not sure if this is the best way to go, but....? That's a hell of a detailed accumulation map! A work of art even if it's not overly accurate. Looks like a topographical map you'd find if hiking in the west! # of snows over 4"
# of snows over 8"
# of snows over 12"
I think I got most of it but there may be some more,but u get the idea,all of this is measured at MSP,I think you should try something like this with your readers to expand your blog next season since were already in the middle of this one. I was thinking the fantasy weather would work by picking a met (and going with their forecast) as you would in sports. Your stuff sounds more like things a Las Vegas bookie would take (but still interesting, to be sure!). It has been odd with the flurries... no one has predicted them... I don't think. I do not know about you guys, but they have been slowly picking up steam here. @bemaki Indeed. And this seems to be the third time in a little more than a week where clearing never happened. Kare 11 called for flurries last night into this morning, and then this morning Sven said they could last all day with clearing this evening (which is yet to materialize). It's been a snow globe in my area most of the day, but nothing accumulating. Good news: Mother Nature will be hard pressed to plummet my low to the forecasted +1 if it stays cloudy. In other news, our favorite national "weather outlet" is calling for both temps above freezing next week (yikes for those of us with grass still poking through the snow) followed by "snow much of the time" on the 17th. Really? Snow "much of the time?" How precise. I'll write that in my planner! @Bill...interesting thought, what would you do if a event would happen and a met is on vacation? would one get to choose a backup? Or choose team's 4,5,9,11 etc?? just another thought. @AB, our favorite national weather outlet may be onto something, I thought this mornings runs of the GFS and ECMWF were about to ramp up a storm for the Great Lakes area around the 15th, tonight's run of the GFS now shows that..at this time it doesn't look to effect us much, waiting tonight for the ECMWF, nothing to get excited about right now, just something to watch. @big daddy,awesome idea sounds like something I would get into,Bill will you be adding this to your blog?